We can guarantee that Nerstane’s genetics will improve your flock. But we don’t want you to just take our word for it, we want you to thoroughly evaluate the performance of our genetics for yourself… and we’ll help you set up and run your evaluation. 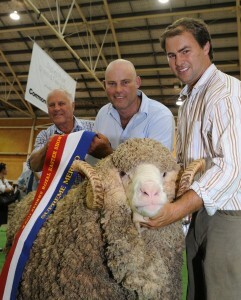 It’s the only truly accurate way of demonstrating what the Nerstane bloodline can do for your individual flock. The results of our breeding program and objectives speak for themselves in our clients’ flocks, Central Test Sire Evaluation sites all over Australia, our show results, and of course at Nerstane. We also want you to find out from others what our genetics are like. We can put you in touch with breeders in your area – they’re the ones who can really tell you about the performance of Nerstane genetics. The two major outlets for Nerstane rams each year are our On-Property Ram Sale and various Multi-Vendor Ram Sales held in NSW and VIC. Please contact us today to discuss your flock’s genetic requirements. We look forward to talking to you.